SLA Europe Members – why we need each other. Here we sat down with Seema for a chat about SLA membership and how it can benefit you towards your CPD goals. For those of you who do not know me, I am SLA Europe’s Membership Chair. This was a role recommended to me by SLA Europe’s Past President, Sam Wiggins, as a very important role with entails liaising with SLA members and all the activity that goes with our membership management. I have been an SLA Europe member for over 15 years and you may recall my blog post from a few years ago. Más rud é nach, I will reiterate that I find my membership essential for my own continuing personal development, but also for any line managers and their teams. 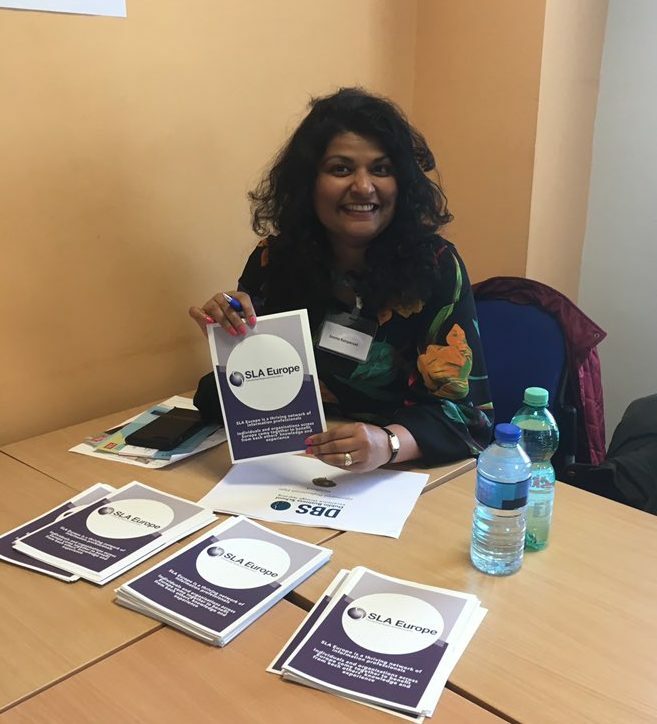 SLA Europe is also a volunteer membership organisation and there are opportunities for me to develop valuable skills too, from which I have also benefitted. SLA Membership is vast, global and made-up of diverse sectors in all industries. We have members and organisations from various backgrounds in academia, gnó, science, rialtais, independent professionals, new graduates, student members, suppliers, retirees and other miscellaneous persons. We offer a flexible pricing structure for our members for whatever stage of their career they may be at currently. The flexible pricing structure for membership is available on our website anseo. We have listed 10 reasons for why you should join SLA Europe or renew your membership. Personally I like being a member for the CPD, networking events and staying ahead of the curve. We just hosted our annual Winter Warmer Quiz, held the first of our ‘Wednesday Webinars’ on GDPR, and our upcoming events include Career Stories ‘Starting your own Business’ and a walking tour entitled ‘Spring Stroll: Following on the Footsteps of the Suffragettes’. Believe me – we are constantly looking out for relevant topics and events to help you develop, learn and network with others in the library, knowledge and information field. Féach ar ár Flickr page for photos of our previous events. We also have a global membership base and can rely on this extensive network for answers, shared experiences and possible collaboration opportunities. 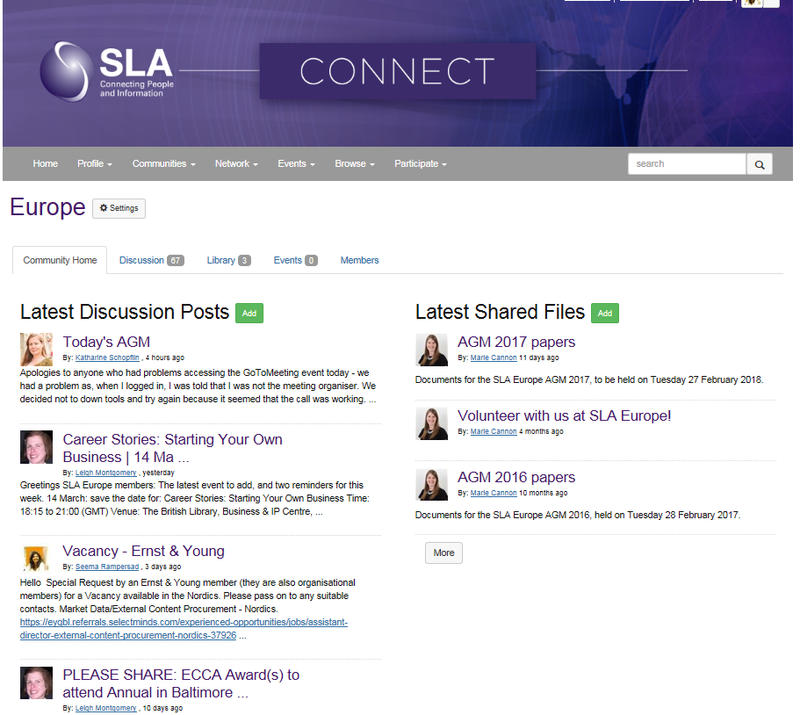 An SLA Connect online platform, and its members community allows you to see what other professionals are doing, and to engage in a dialogue on any issues and developments that may be relevant to you. I recently posted a vacancy for a role in Scandinavia on the request of one of our organisational members. It can be isolating without other professional members to bounce ideas off, to share experiences and benefit from lessons learnt. 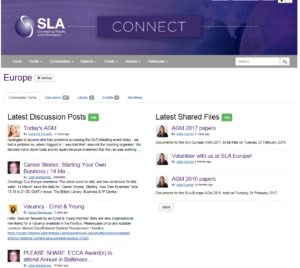 Within SLA Europe we have valuable face-to-face or person-to-person opportunities for you to contact, ask, discuss and advise each other. You can also liaise with SLA’s chapters and subject areas to gain new insights and skills. As a result of our 2016 suirbhé, we are aware of some of the areas we still have to refine and improve on – we are constantly trying to reach our members outside of London and in other European countries. We have about 50% of our members who are in other European countries, the USA and across the world. Our webinars are part of this, and are a members-only benefit. We are supporting events around the UK, hosted an event in Dublin last year, and hope to host a European Conference in the future. What can you do for us? …We honestly want you to help us advocate and extol SLA Europe membership benefits to those you might know who are not as yet members. If you regularly pay to come to our events as a non-member consider joining. You could benefit from other CPD events and resources like SLA Connect. We also need you to stay members, and perhaps, time permitting, to get involved as a volunteer member. If you do find it expensive to fund your own membership we’re happy to help make the case to your employer to sponsor your membership. The investment and benefit to you as a professional far exceed the cost. Also you may also want to take up an organisational membership (for up to three members, which can be transferrable if someone leaves your organisation). Students (and retired members) can join at a reduced price. The brilliant Gradaim Comhdháil Luath Gairme (ECCAs), could already give you the opportunity to attend the SLA conference in the USA. We’d like to find out what else we can do for those at the start of their careers. I hope this helps you decide to join us for your future with SLA Europe or to remind you – our Membership needs you!